Most people know that CRM is synonymous with Sales and Marketing. But did you know that CRM systems can also be used to improve customer service? Technology like Sage CRM can help your service and support teams deliver a consistent customer experience, resolve issues faster, and improve customer satisfaction and retention. Here are 6 ways Sage CRM helps improve your customer service levels. With Case Management and Cases Pipeline features, you can monitor open support cases to make sure customer inquiries are followed up with and nothing falls through the cracks. New Support cases can be created from incoming customer emails, support requests from your website, or from customer telephone calls. You can also automate the handling of support cases using Customizable Workflows with escalation and notification to ensure a consistent customer service experience every time. With Sage CRM, you can provide each team member with the tools they need to resolve customer service issues. It provides a single system that your team can access to record support call details, history, and previously suggested solutions. That way if the customer calls back, your entire staff is up to speed on the details of the customer case and can pick up where the last communication left off. With all customer queries, support activities, and service requests recorded in Sage CRM, you’ll begin to build a Knowledgebase of common issues and resolutions over time. Your customer service team can use the powerful built-in search engine to review prior customer issues, resolution procedures, FAQ’s, and reference material to provide quick and informed assistance. 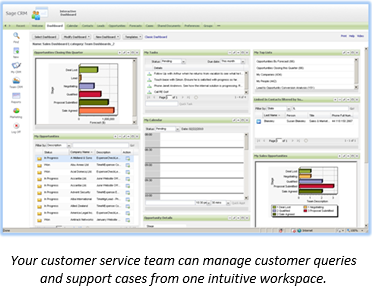 With its easy to use interactive workspace, Sage CRM puts all the information your customer service team needs in one place. Get an up-to-date snapshot from the Interactive Dashboard and even create dedicated customer dashboards for key accounts. A comprehensive suite of standard and Custom Reports provides the analytics you need to assess important metrics like support volume, average time to resolution, case escalation frequency, and follow up statistics. Empower your customers to find what they need online at their convenience - 24 x 7 - with the ability to add or edit tickets, submit comments and attachments, and track the status of their request. With Web Self Service, Sage CRM helps your customers help themselves - freeing up your customer service resources and improving productivity. If you'd like to know more about Sage CRM and how it can help your organization please contact Equation Technologies today. Equation Technologies is a certified Sage partner and an expert is Sage CRM.